I know it is past Christmas for most people, but for me, in one of the last few places in the world to be so, there is still about 15 minutes of Christmas left here on the West Coast. So, whew, made it in under the wire. The above image is our tree topper for this year. There is too much going on to have been able to get a real, normal sized tree like I would normally like to do, so we opted for a mini, artificial tree, for now. 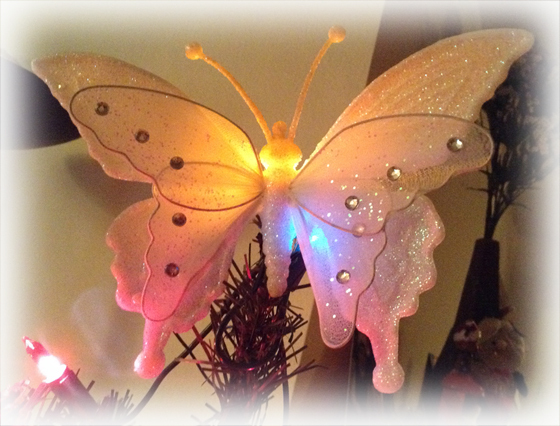 We could not find any nice mini angel tree toppers, which was our preference, so we picked up this beautiful butterfly. I am really glad we did, I love how it looks with the lights behind it. Being one of my favorite things also helps. I like to think of butterflies as almost miniature angels of the animal/insect kingdom. We had a nice evening at J’s brother’s house. I am feeling gratitude for my new extended family, and for the warmth of love around me for the holidays again. There was a time when I did not have that. And I wish to send out into the universe wishes to my now deceased Mom and Dad, and also to P. I love you three more than there are enough words for. I wish more than anything I could think of in heaven or earth, that I could have been sharing this holiday with all three of you. I hope somehow, someway, your heart can receive my love and wishes. What inspires me today is love and family. I would love to know what inspires you. I hope your Christmas has been filled with both abundantly! P.S. Stay tuned, I have plans for some varied content to come out in the next week or so. I honestly feel its going to be a great new year and I have some wonderful plans. I hope it will be exciting for us all. I have a few nifty ideas I cannot wait to share with you!